Alaska is home (at times temporarily) to about 500 different species of birds. From bald eagles to chickadees, the Last Frontier is a can’t-miss birding destination, whether you’re looking to improve your bird-watching chops or just catch a glimpse of a few new feathered friends. Just in time for summer, here are a few basics to start your northern birding adventures off right. First, bringing along a few books will help you find and identify species across the state. “A Birder’s Guide to Alaska” by George C. West has been called the best guide to bird watching in Alaska and is filled with detailed information about where and when to find specific birds, along with maps and trip-planning suggestions. Other favorites are “Guide to the Birds of Alaska” and “Alaska Birds: A Folding Pocket Guide to Familiar Species.” You can find these titles at most local bookstores in the state, or order online before your trip to do a little studying. While it’s hard to predict just what you might see, there are a few species you’re likely to spot during a summer trip to Alaska. Bald eagles are always a favorite, and especially abundant near the coast in the Southeast and Southcentral regions of the state. With a wingspan of over seven feet, they are Alaska’s largest bird, and one of the most striking. On the smaller side of the scale, keep your eyes peeled for the ptarmigan, the Great Land’s state bird. The willow ptarmigan has an expansive range and can be found most all over Alaska, especially on the Kenai Peninsula, the Kotzebue Sound and in the Brooks Range. It’s a sedentary bird, which means it calls one location home all year long rather than migrating, but you might not recognize it from one season to the next. In the summer its feathers are mottled brown and in the winter months the bird is white as snow with some black feathers in its tail. 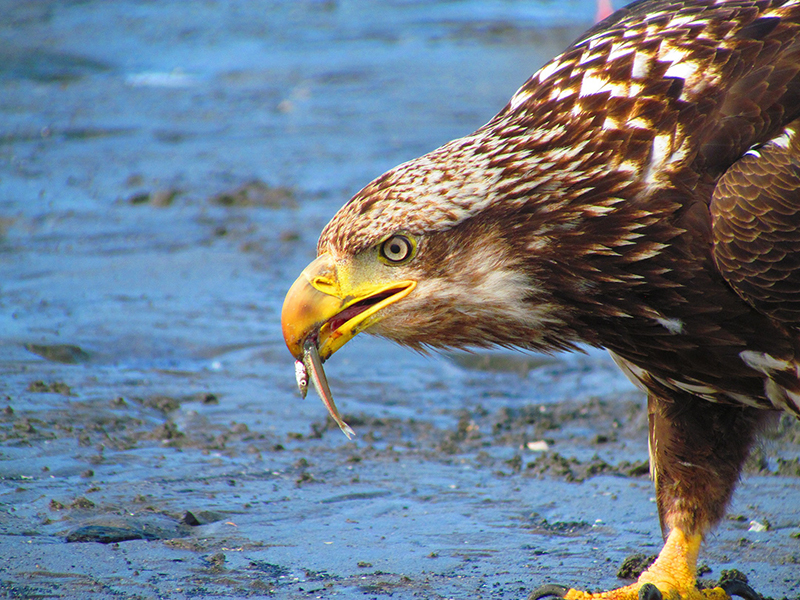 We recommend trying to spot all of the species the Alaska Department of Fish and Game calls the “all stars.” In this illustrious group are the aforementioned bald eagle and willow ptarmigan as well as eiders, loons, ravens, snowy owls, surf scooters and swans. For the ultimate challenge, print off this checklist, grab your binoculars and get searching! What species are on your northern birding bucket list?